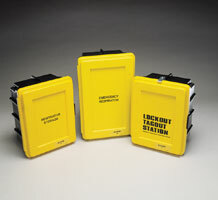 The Lockout/Tagout Wall Case is lightweight and molded from sturdy ABS plastic. The case is available in high-visibility yellow or green for use during an emergency. Store air-purifying respirators, cartridges and other accessories in the Respirator Storage Wall Case, and use the Emergency Respirator Wall Case to house up to two 5- to 10-minute EBSs.